The idea of an Olympic mascot was officially approved at the 73rd Session of the International Olympic Committee in Munich 1972. However four years earlier there was an unofficial mascot at the 1968 Winter Olympics in Grenoble, France and at the SUmmer Games in Mexico 1968 there were unofficial dove and jaguar mascots. The first official Olympic mascot was Waldi the dachshund at the 1972 Munich Olympic Games. Since then, mascots have become a major element of the Olympic brand. Mascots act as a vehicle for communicating the Olympic spirit to the general public, especially children and youth. They have come in many shapes and sizes, though they all convey the theme of the Olympic Games, and showcase the distinctive geographical features, history and culture of the host city. Up until 1992, most Olympic mascots were created based on an animal unique to the host country. Since then, human or invented figures have been used, and often more than one mascot - the 1998 Nagano Winter Olympic Games had four mascots; the 2000 Sydney Olympic Games had three and the 2004 Athens Olympic Games had two, and Beijing had five! London went back to one, but one for each of the Olympic Games and Paralympics, as did Rio. The two mascots for the Athens Olympics are based on thousands of years old dolls found at archeological sites in Greece. They are called Athena and Phevos, and have whacking feet, longish necks and puny heads. One is colored deep yellow, the other in deep blue. They are named after two gods from Greek mythology: Phevos, the god of light and music, and Athena, goddess of wisdom and patron of the city of Athens. The three mascots from the Sydney Olympic Games are based on native Australian animals. Their names are short for Olympic, Sydney and Millennium. "Olly", a kookaburra, epitomizes the Olympic spirit of generosity and universal generosity. ; "Syd", a platypus, represents the environment and captures the vigor and energy of Australia and its people. ; "Millie", an echidna, is a techno-whiz and information guru, with all the facts and figures at her fingertips. The mascot of the 1996 Olympic Games in Atlanta was an abstract fantasy figure. It was given the name Izzy, derived from "What is it?" because no one seemed to know exactly what it really was. The mascot for the Barcelona Games was a dog, which had its own specially produced TV series. The Seoul Olympics mascot was a little friendly tiger, which portrays the friendly and hospitable traditions of the Koreans. The name comes from 'Ho', which is derived from the Korean word for tiger, and 'Dori', which is a diminutive for boys in Korea. The mascot wore the Olympic Rings around its neck, much like a medal, with a traditional Korean dance hat on its head. The mascot for the LA Olympics was designed by Walt Disney. The Eagle wore the outfit of the legendary American Uncle Sam, with a star-spangled background in red, white and blue. 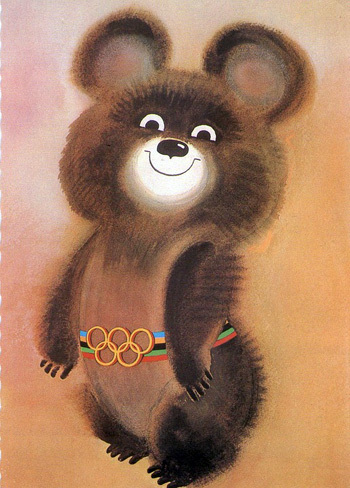 The Moscow Olympic mascot was a bear called Misha. This mascot was developed by Victor Chizikov, a renowned illustrator of children's books. The Misha mascot became very popular around the world. The Montreal mascot was a beaver called Amik. The name Amik means beaver in the Algonquian language, the most popular language amongst the American Indians in Canada. The Munich mascot was a dachshund, which represented qualities which are indispensable to an athlete: resistance, tenacity and agility. This was the first official Olympic Games mascot. There were unofficial dove and jaguar mascots. The Jaguar mascot was based on a throne in the shape of a red jaguar in the "El Castillo" pyramid at Chichen Itzá. The stylized white dove represented the slogan of the games, "Los juegos de la Paz" or "Games of the Peace". Quiz: What Australian Animal was Syd, one of the 2000 Sydney Olympic Mascots?